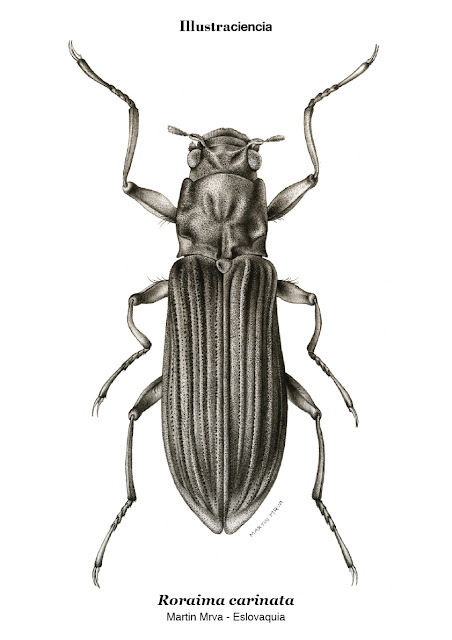 Riffle Beetles or Elmidae are a moderately large family of aquatic Coleoptera with cosmopolitan distribution and two subfamilies, Elminae and Larainae, including almost 1500 described species. Generally, typical features of species from this subfamily include small body of 2 – 11 mm with obovate or elongate, convex or slightly flattened shape and black or dark brown colour. The highest diversity of subfamily Larainae is known in Afrotropical, and Neotropical regions from where the illustrated species comes. Roraima carinata is a dark coloured beetle with elongated body with length of only about 5 mm and breadth up to 1.7 mm. The species was described in 1999 and to date, it is known only from its type locality which is the table-top mountain in south-eastern Venezuela – Mt. Roraima, a place isolated from human activities. As the species is still understudied, its ecology including food requirements are unknown. The illustration depicting important morphological features of the beetle was realized from one of the few collected specimens with use of strong magnification provided by stereoscopic microscope.